Welcome spring! The first day of spring is one of my favorite times of year. There are certainly moments I treasure more, like when I bite into the season’s first homegrown tomato or the first really warm Saturday where you can host a BBQ and not need to put your sweater on, even after the sun has set. But there is something about the anticipation that comes with the first day of spring that is unmatched in any other season. This weekend, I will be setting out some of the seedlings that I started indoors almost six weeks ago and next weekend it will be time to head to the annual Tomatomania festival held in various different parts of Los Angeles. With more than 200 heirloom tomato seedlings to choose from, I’m sure to get some beauties for the summer. So, with all the anticipation of the season to come, I decided to mark the first day of spring with a meal that highlights some of the season’s greatest offerings. Traditionally, eggs symbolize the rebirth of spring. It’s why we spend hours decorating and hiding eggs on Easter. Some argue, including Russ Parsons in his book, How to Pick a Peach, that asparagus might be a more fitting representation; certainly, there are legions of asparagus fans who would agree. After all, asparagus is one of the first spring vegetables you’ll find at the farmers’ market, even before the season has officially begun. Finally, there is no arguing with the lamb that graces many a springtime table. I knew if I could put all of these ingredients on the same plate, I would have a fail-proof first meal of spring. The lamb and asparagus were easy. I think simple cooking is best with fresh wonderful ingredients; all either needed was a bit of oil and salt and pepper before roasting. To incorporate the egg, I did a very simplified version of a mimosa dressing by just barely taking the eggs to hard boiled and then dicing them to top the roasted asparagus. Allow lamb to come to room temperature. Place in a baking dish large enough to hold the rack and drizzle or rub with olive oil. Sprinkle with salt and freshly cracked pepper. Remove leaves from half of the thyme sprigs and sprinkle over the lamb along with two whole thyme sprigs (reserve additional thyme for the asparagus). Place in the oven and roast for 15 – 18 minutes for medium rare. Allow the lamb to sit, tented with tin foil, for 10 minutes before cutting and serving. Break off by hand or cut off the bottom woody stem of the asparagus. Use a vegetable peeler to remove the tough outer skin. Peel from about an inch or two below the tip to the base. Toss asparagus with a little olive oil. Sprinkle with salt and pepper and the leaves from the remaining two thyme sprigs. Roast in the same oven as the lamb for 15 – 20 minutes until just starting to soften. Place eggs in a small pot of cool water and bring to a gentle boil. Allow the water to boil for 4 minutes and remove from heat. Let the eggs sit in the hot water for about five minutes more. Rinse under cool water until eggs reach room temperature, then peel. Place 3 – 4 lamb pieces on each plate. 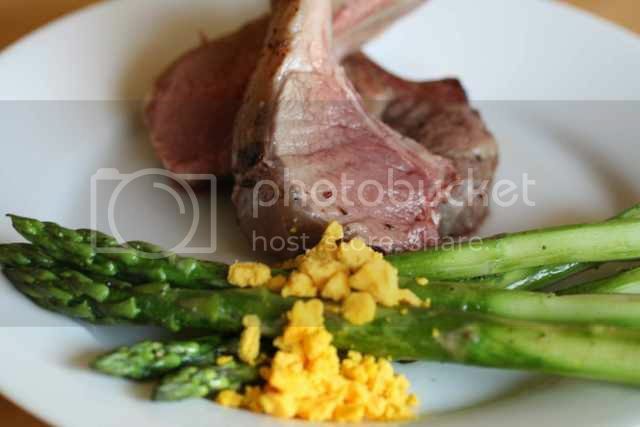 Place 4 – 6 asparagus next to the lamb. Roughly chop the egg yolks, reserving the whites for another purpose. Sprinkle the egg over the asparagus and serve. OOOhhhhh MMMMMMM.....I love lamb!! I can't have enough of it!! I will have to wait until April foor tha asparagus!! I can't wait!! Thanks!!! Yahoo for spring! 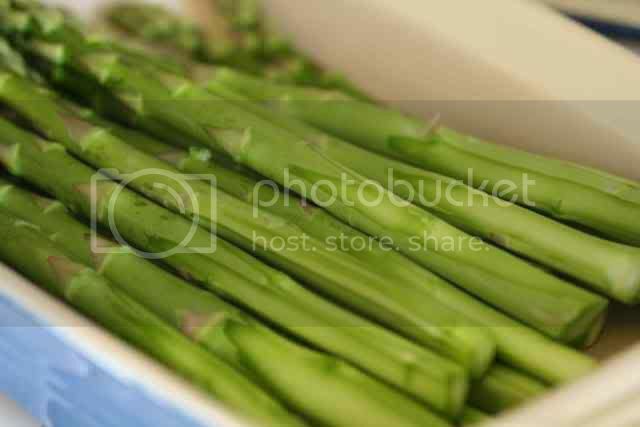 Love asparagus, your photos are so vibrant!! Lovely. A little sprinkled goat cheese really makes the asparagus divine. Tell me more about this Tomato festival. We have an heirloom tomato plant from TWO summers ago that's still putting out a fruit now and then, but I think it's time to put the thing out of its misery and I have convinced the husband (the gardener) that we MUST have tomato plants this summer. What a creative way to do asparagus -- I would never think to prepare them like that, but they look wonderful! I'm so jealous of your heirloom tomato seedlings -- I wish I had a garden for some! I am SO happy that it's spring! That rack of lamb looks great, and I'm buying a ton of asparagus this weekend. Spring! But wait, it's 25 degrees and grey... I need an equinox do-over... Your supper makes it feel a bit better, though! What a beautiful meal. Your photographs are lovely. What a perfect spring plate! Come to think of it, I ordered something very similar in a restaurant earlier this week... Love this time of year! I just love the fact that spring has finally arrived! It just seemed like a very long winter! But with the weather being really nice for the last coupe of days I am getting that spring feeling now too. Your dish is just the perfect beginning for a wonderful season! Happy first day of spring! Looks like a wonderful way to celebrate - yum. I could not be happier that the winter is over. Asparagus is certainly the first food I think of too! This is a gorgeous and stunning meal. I can just imagine the taste. Lovely! If only it would warm up here (the feel like temp this morning is 16!). 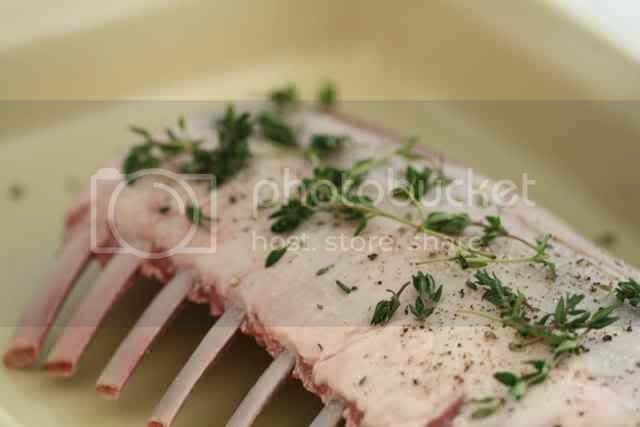 I love cooking rack of lamb - yours looks delicious! the first picture in this post is making me happy just to LOOK at it. that rack of lamb would cost us about $50... but i still want it. the perfect spring meal.